Allonby is a small village five miles north of Maryport on the Solway coast. It was a busy fishing village for many years; its main catch being herring which were smoked in the Fish houses. It is known for its long sandy beaches, grassy sand dunes and views over to Dumfries and Galloway. It is popular with wind surfers and walkers. Traditionally workers from the North East have come here for their annual holiday to stay in the numerous caravan sites scattered around the village. It is a friendly place and the sunsets are vivid. The fishing industry has gone but you will see some grand houses on your walk as well as the imposing building which was Public Baths and the Reading Rooms, the legacy of a quaker beneficiary which is now being privately restored. A walk round the village reveals plenty of Kelly subjects. He and his wife Audrey moved there, to Glen Cottage at the heart of the village in 1958. His 12 years in Allonby was a life changing time. 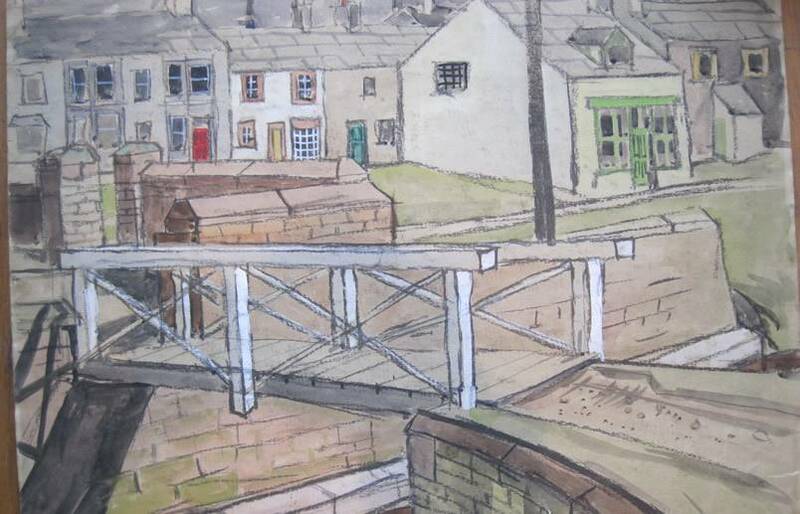 He gained a place at Art College in 1961 aged 42 to learn printmaking. He was in his element at last. The tutors were bemused by his abilities in draughtsmanship and design which came quite naturally to him. He had a studio in the back scullery at Glen Cottage and filled the whole house with work. He always had some old high maintenance vehicle which he constantly tinkered with and habitually broke down. Glen Cottage today is little changed inside and out. He made paintings of its interiors when he couldn't get outside. He described the cottage in detail in letters to Joan David. 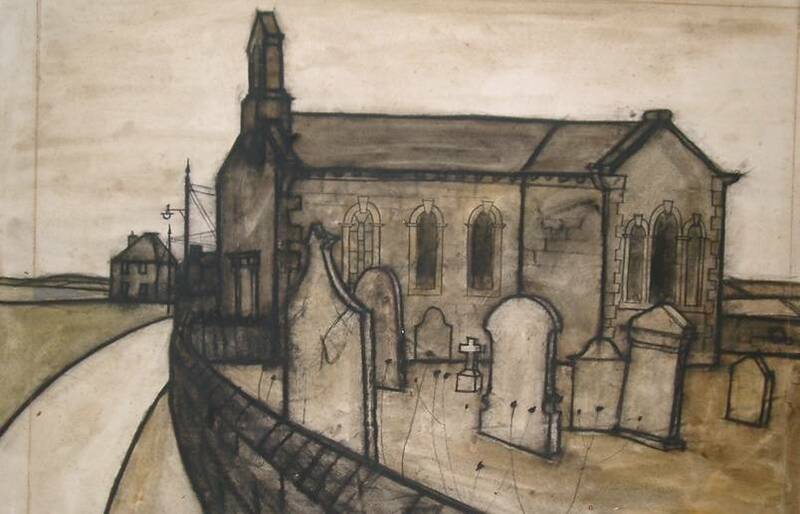 He used Allonby for exercises he was given at the college - a screenprint of the village from the sand dunes to the South won him a distinction in his final NDD examination. Despite fabulous sunsets and sweeping sea views he always looked inland for subjects. He resolutely stood with his back to the sea. The little beck which runs parallel to the coast and the numerous bridges interested him much more. The juxtaposition of the clusters of houses and farms in the narrow streets gave him endless compositions. His output was at its peak. This was the time when he had a flurry of exhibitions. Sir Nicholas Sekers at The Silk Mills in Hensingham became his patron gave him his first exhibition in 1966 at Rosehill Theatre in Whitehaven. This was followed by another in Sloane Street in London where he met Lady Fermoy who then gave him an exhibition at her gallery in Kings Lynn. 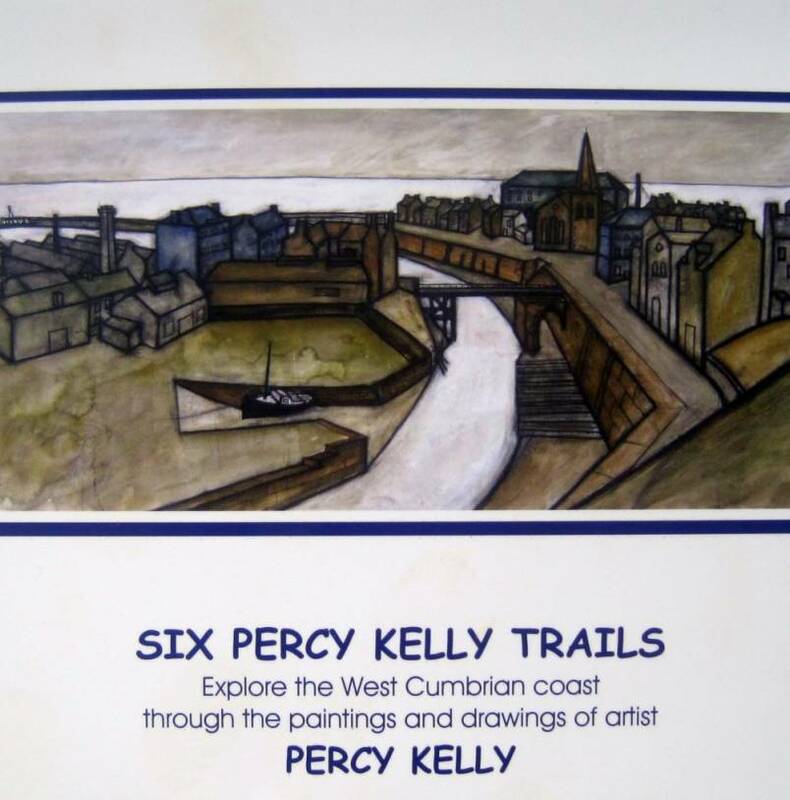 Much of the work in these shows were based on Allonby and Maryport. In 1970 his depression returned, his marriage was threadbare and he didn't want any more exhibitions. This all came to a climax when Audrey realised he was cross dressing with her clothes and make up. 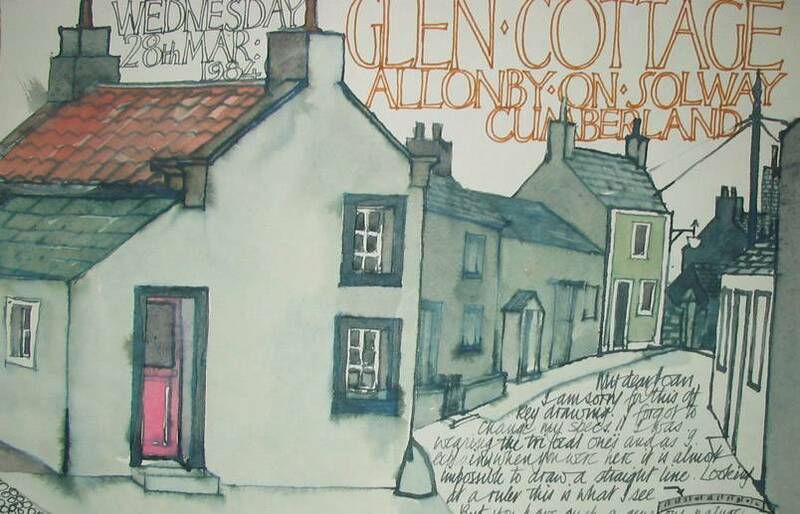 She threw him out, changed the locks and divorced him and he left Allonby for ever leaving a rich collection of work based on this village. where he had spent 12 productive and creative years. 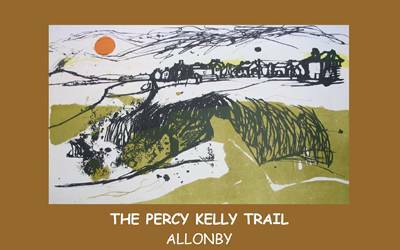 Buy the Allonby Trail online »» Available as a PDF download.